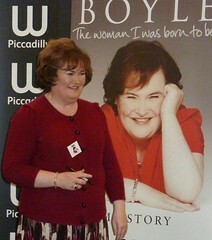 If you're looking for a Christmas gift this year, there's bound to be somebody in the family who would surely enjoy a copy of Susan Boyle's new CD The Gift alongside a copy of her recently published autobiography - The Woman I Was Born To Be. The shy Scottish singer was in London this week to meet and greet hundreds of fans of all ages who queued outside Waterstone's, in Piccadilly, for the chance to chat to her and have their copy of the autobiography signed by the star herself! As is clear from the video below, SuBo's overnight success hasn't gone to her head and she seems delighted to meet her fans and greet them all individually!